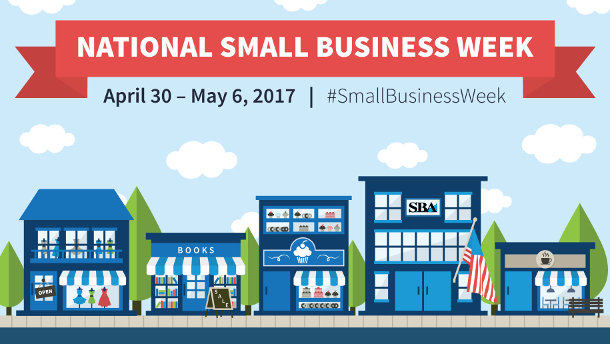 As declared by the President of the United States, April 30-May 6, 2017 is National Small Business Week, a time to recognize the important contributions of America's entrepreneurs and small business owners. More than 50 percent of our country either owns a small business or works for one. Small Business Week is also a great opportunity to reaffirm your message on social media by using #SmallBusinessWeek and other SMB hashtags on various social media platforms. This is the perfect time to share the story of how your business began to help raise awareness of the importance of small businesses to the American economy. Be sure to review the Small Business Week website for helpful hints and tips, as well as to take advantage of the informative webinars and training SBA will be providing throughout the week.